Exclusive listing of our members on the Garden Route, specialising in Hotels, Guesthouses/Lodges and Self catering establishments. We also offer tours and adventure packages. Squirt will be the official lube at the inaugural 3 Stage Marrick Challenge MTB race held on the scenic Marrick Safari Game Farm near Kimberley; 3 Stages - 3 Days - 240 kms! Mountain biking in the Northern Cape is fun because of the wide variety of terrain which is available, unlike riding on asphalt everyday (those poor roadies). This terrain is influenced by weather factors, temperature, time of year, and natural elements and hazards. It is a new experience with every ride. Participants in the inaugural Marrick MTB Challenge will cover over 240 kms and catch views of various game species, including Giraffe, Zebra, Gemsbok, Springbuck, Wildebeest and Waterbuck before they reach the tranquillity of the Marrick Safari Lodge finish. 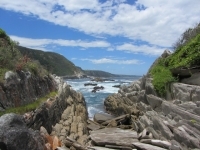 Welcome to the Cadeau Hiking trails � the latest addition to South Africa�s national hiking trails situated along the famous Tsitsikamma National Park�s coastline. Our hiking trails were previously not accessible to the public. This is the first!!!!!!!!! We invite you as hiking club and member to our opening special for the month of February and March 2012 at the special discount of 30% on accommodation and the one day trail (guided).